WEDDING BANDS: WHEN IS THE RIGHT TIME TO PURCHASE? It would seem that most of our clients consider weddings band decisions and purchases after they have found or created their ideal engagement ring, however there are a number of important factors to consider up front. One of these aspects involves how important it is for the bride and groom to have a matching wedding ring set. Popular male bands tend to consist of a straight plain band, and therefore before purchasing an engagement ring, we highly recommend a conversation surrounding design considerations of the wedding band so that the outcome of the set matches. An important element is the aesthetic appearance of a gap between the two rings, and whether that will be of concern to the bride. It shouldn’t be overlooked because we can work on customising finer details, as we strive for the brides’ absolute satisfaction. For some, simply customising the contours and shapes of the band so that it matches the accents and stone settings of the engagement ring is all it takes to ensure a seamlessly blended set. We also have to consider what would suit the brides’ lifestyle, as not all brides will wear the set together on a daily basis. When it is not appropriate for a bride to wear the engagement ring due to work or lifestyle constraints, she may choose to create a more extravagant band, or one that works both independently and cohesively with the engagement ring. In such situations, it may not be as important to have an absolutely flush set. We have a number of diamond band options that work well independently, with added intricate details of milgrain edging, combinations of round and emerald cut diamonds and a variety of precious metal options if duotones are a preference. We look to create a beautiful ring that will compliment the engagement ring, but hold its own as a special piece if worn separately. Given the bridal sets are lifetime pieces, it is ideal that the aesthetic and overall functionality of a wedding band is a consideration in the conception of the engagement ring. We always want to ensure that when we spend 60 to 70 hours constructing the perfect engagement ring, the bride to be will be ecstatic with the outcome, inclusive of the wedding band. With Matthew’s vast experience in design we take the time to discuss these finer details with you from the beginning to ensure the best outcome and produce an heirloom quality wedding set that will be treasured for generations. 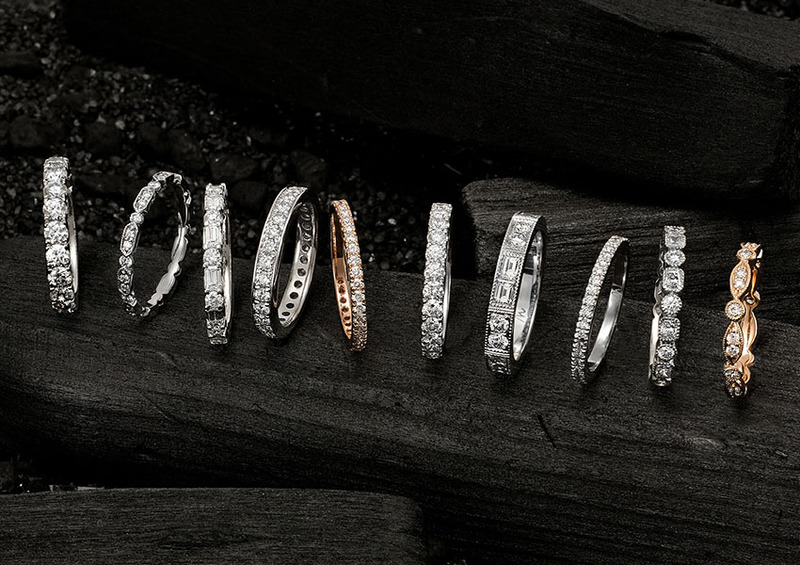 To learn more about our wedding band options, contact the boutique to arrange a complimentary consultation.